Former Hibernian and Dundee manager Jim Duffy has been confirmed as the man to replace Michael O'Neill in charge of Second Division outfit Brechin City. 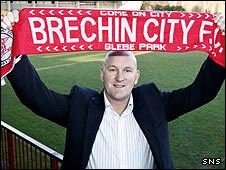 Brechin chairman Ken Ferguson said: "Jim brings a wealth of experience from both his playing days and, of course, an illustrious managerial career. "We were quite amazed at the high quality of the applicants." Duffy was director of football with Hearts in 2006 and had coaching spells with Chelsea, Portsmouth and Norwich. He also turned down offers to manager Bohemians and Cambridge United in recent years. O'Neill left his post at Glebe Park in December to take on the managerial job at Shamrock Rovers.